As I was working on refurbishing my raised beds that got destroyed recently by Sandy I though of the reasons I will build again. 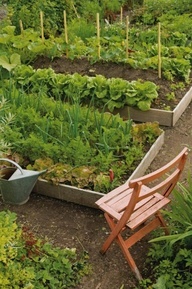 In todays world of home gardening, raised beds, instead of in ground gardens, are the preferred way to grow your vegetables and herbs and even some flower gardens. No longer your grandma's garden of digging, tilling and weeding expansive gardens in the ground, the 4 foot by 8 plus plots with at least a 2' path are easier to maintain and have many advantages. The soil in the beds does not get compacted becuse of easy accessibility on paths. Soil compaction is a major factor in reduced yields. 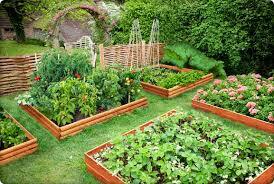 The soil can be easily made specific PH for different types of plants. Once established raised beds do have to be watered a more. Setting up a drip or soaker hose system with a timer allows the busy home gardener to have more time to actually enjoy the garden "work" during the growing season and is a way to conserve water. 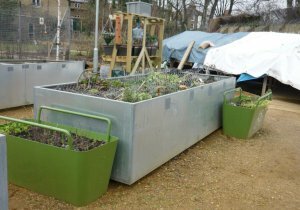 Materials for raised beds can be as economical or as expensive as the gardener wants. No longer for the person that knows how to build. 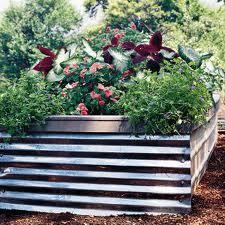 Raised bed kits are sold for those that do not have the carpentry skills or the time. They can be wood, brick, stone, concrete block, metal, man made wood and a variety of heights. Instructions are easy and can be found on a variety of website as well as kits to be purchased and put together. Below a few sites for information and to inspire.